Perfect Pieces Ruskin Vase on BBC Antiques Master! Here at Perfect Pieces, we notched up our second ever television appearance last night – or at least, a piece of our stock did. We have previously sold items to a Bargain Hunt team and last night one of our Ruskin vases appeared on the BBC Antiques Master program. This show, in case you haven’t seen it, is a kind of Mastermind for antiques – contestants have to answer questions on both their specialist antiques subject and on a wide variety of other antiques. They are then gradually eliminated to leave one winner, who will go through to the final of the series. It is presented by Sandy Toksvig with expert advice from Eric Knowles. Last night’s episode featured our blue Ruskin Pottery vase in the final round of the show – a ‘fingers on buzzers’ round where the final two contestants battle it out. The Ruskin question did not relate specifically to our vase; the two contestants were asked in which decade the Ruskin Pottery was founded (the 1890s). Both contestants got it wrong unfortunately, but we knew! The vase in question is a fairly late piece of Ruskin that is undated but probably dates from the 1920s. It has an impressive bulbous shape, stands 9″ tall and is decorated with a mottled matt and gloss blue glaze. For full details and more pictures of this Ruskin vase, click here. Antiques Master is on BBC2 on Monday nights at 8.30pm – last night’s episode can be viewed on iPlayer until the 29th August – click here to see our Ruskin vase on Antiques Master. This entry was posted in Site News and tagged Antiques Master, BBC, BBC Antiques Master, Eric Knowles, Ruskin pottery, Ruskin vase, Sandy Toksvig on August 23, 2011 by Perfect Pieces. Made at the start of the 1900’s (1922 to be precise) this teacup and saucer is extremely fine and delicate and has been decorated with a lilac lustre glaze. On its base both the cup and saucer have the Ruskin pottery mark and the cup has the date stamp for 1922. This piece is certainly very different to the large and heavy Ruskin pottery vase we also have in stock. This vase is a large heavy piece marked with the Ruskin England impressed pottery mark on the base – you couldn’t get two pieces more different! This entry was posted in Ruskin and tagged Cup & Saucer, Ruskin pottery, Ruskin vase on September 16, 2009 by Perfect Pieces. If you’re looking for a pottery vase that’s impressive in both size and design, then take a look at this small selection of what we at Perfect Pieces currently have for sale. Stylish in design and reputation, Wedgwood’s Keith Murray’s pieces are becoming more collectable as people are looking for modern pieces to suit their modern lifestyles. We currently have this stunning Keith Murray designed Shoulder Vase for sale in our Wedgwood pottery section. Standing just over 11″ tall, it’s an impressive piece and is decorated in the classic Moonstone white glaze. The modern design of this vase allows it to sit happily in any surroundings – especially modern homes. Click here for further details. If you’re looking for something more colourful, then why not take a look at this vibrant Crown Ducal Ware vase? This large Crown Ducal Ware ovoid vase stands just over 10″ tall, has a ribbed body that has been decorated with a bright stylised flower-head pattern. It would fit even the largest bunch of flowers! For further pictures and information – click here. Another interesting and unusual piece is this stoneware Ruskin pottery vase. Known for the quality and innovation of its glazes, Ruskin was a leading British art pottery in the early 20th century, but its wares were only ever produced in relatively limited numbers. 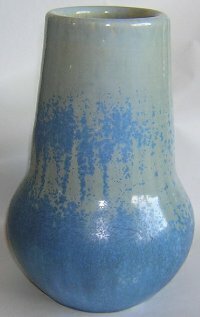 This extremely heavy Ruskin stoneware vase has been decorated in tones of blue and grey and stands approximately 9″ tall. With a light speckled decoration this Ruskin vase is simple in pattern and design but like all Ruskin, is beautifully proportioned and benefits from a fantastic glaze. Click here for further pictures. I hope this examples will provide you with some inspiration and a few ideas as to what’s available. Do remember if you have any questions or are looking for a specific item then do let us know to see if we can help. This entry was posted in Gift Ideas and tagged Crown Ducal, Crown Ducal Ware, Keith Murray, Ruskin pottery, Wedgwood on January 4, 2009 by Perfect Pieces. Looking For That Perfect Cup & Saucer? If you’re looking for a cup and saucer then why not take a look at the two pictured below? The first is a stunning Ruskin Pottery lustre cup and saucer and the second is a fine Shelley China Trio. This is a superb example from the Ruskin pottery, an extremely fine and delicate cup and saucer decorated in a stunning lilac lustre glaze. Dating from the early 1920’s it really is a superb piece of design from a top quality pottery. The Shelley china trio, on the right, is decorated in an almost Art-Nouveau pattern on a Vincent shape trio. Dating from the late 1920s to 1945 this set is typical of that era. Offering a totally different style this set is perfect for Trio collectors. For further details and pictures of the Ruskin Pottery cup and saucer – click here. And, for further information on the Shelley China trio please – click here. So, if you think one of these cup and saucer sets will satisfy the receiver of your gift then don’t forget until Christmas Eve 2008 we are offering 5% off ALL prices and both these pieces include FREE UK postage and packaging as well! This entry was posted in Gift Ideas and tagged Cup & Saucer, Ruskin pottery, Shelley China, Trios on December 21, 2008 by Perfect Pieces.